There are certain types of universal and great garments, which are suitable for just any style and combination. Denim shirts belong to that type of garments and, of course, like in case of all the other types of apparel options, there are certain tips and tricks and stylish ideas about what to wear a denim shirt with. Potential pairs are, indeed, numerous and we are going to present some basic options for you to have more creative ideas about styling your lovely and comfy denim shirt. 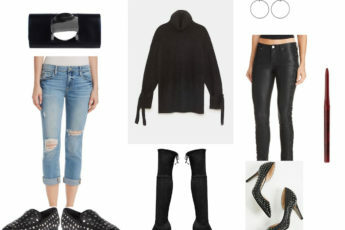 Talking about the styles compatible with this piece, we should first of all note their big number, that is, the denim shirt is ideal for creating a combo of the casual style, military, classic, sporty, grunge, and many more. So below are some examples of how and with what to match a denim shirt. It might seem that denim is not appropriate for business looks, however, in case of styling correctly it can become a great accompaniment to your ideal business looks. For instance, you may use it with a jumper or a sweater, paired with straight classic pants or a straight skirt of black or navy blue shade. It also works well with white shades for the bottom, especially with straight pants and some complementing details like a big watch for accentuating the business look. Denim shirts are really perfect for creating glamorous and chic looks. Furthermore, if they are adorned with beads and sequins, you don’t need to use any extra efforts to make it work for total glam. You may just add some cute and tight fitting skirts or straight pants and the ideal looks are there. Still, if you only have the classic type in your wardrobe, you may create the glamorous looks of yours picking some classic tight fitting skirts and finishing up the look with a wide belt, which can also be narrow in case it’s made of leather. The key detail you should use here are the glittery accessories, more preferably necklaces, and some golden or silver shoes. Talking about the shapes of the skirt, we may also add that it doesn’t necessarily have to be of the straight shape. The flare silhouettes of knee or mini length skirts are also recommended. For those giving their yes to the military style, the denim shirt also has some suggestions. More particularly, you will need a denim shirt of black, green, beige, brown, or grey shade, or else a shade of khaki. Bluish tones may also be used, preserving the extra proportions of metallic details like studs for toughening the looks. You may experiment with a combo involving some greyish tones, or options matching the color of the top, and match it with bottoms carrying military hints (camouflage prints may also be used). Coming to the footwear, the sneakers and sporty boots are recommended here. Also, you may try out options like the combo of the denim shirt with military inspired skirts, finishing it off with knee high military boots or booties. Cuffing sleeves is another great thing to add some masculine touch to the look. For accessories you may use watches, military belts, simple options of leather and metal, as well as sunglasses with rounded shapes. If you want to have that rock-inspired cool looks, accessories should be in the center of attention. Garments like ripped jeans (Learn: How to Wear Ripped Jeans) will be ideal complementary details for these combos. Miniskirts are also included in the basic options. Leather pieces are also recommended here, and may be used with any shape. The color of the denim shirt may vary as well. The same versatility refers to the footwear as well, which can be presented with cute open toe options, or glam-rock inspired pieces with studs. Go Country and Enjoy Your Ideal Looks! Country is the most recommended and suitable style for the denim shirt, offering the greatest range of alternatives. You may match your denim shirt with a white top, or a flare skirt made of denim or brown velvet. The denim shirt may be worn as a separate piece, or for topping another T-shirt or a tank top. Safari style is the following impressive alternative you can consider, which will enable you to create some enigmatic and uber-feminine looks. For this style, you may work out combos of light sandy shades or greyish alternatives matching them with straight beige pants. As for accessories, you may use pieces like panama hats, sandals and sunglasses. Opting for maxi safari-inspired skirts or even dresses is a nice idea. So yes, it does work well with casual looks, especially when coming matched with looks like pleated miniskirts, cardigans topping it and some cuffed sleeves. It does go ideally with maxi chiffon skirts, too, for which it may come as a top with the hems tied in a knot, or as an outerwear garment. It may even be matched with options like the classic suit jacket and straight pants. Slightly cuffed sleeves may spice up these looks nicely. Also, you will get an effective combo using an elongated denim top and matching it with black leggings, using a belt for fastening the waist. What to Pair Denim With? With Denim! So this is the last option we would like to introduce especially for the fans of denim made looks! Matching denim shirts with denim bottoms like skirts and pants is, of course, unquestionably great idea for creating comfy and good looks. Thus opting for a denim shirt is always a good idea, no matter what the style meant to create is. In case of matching it correctly you will get comfortable and dazzling looks quite easily!